10. If you've lost calving ease. The calving ease of Salers is not only documented by extensive research, it's also the single-biggest reasons progressive cattle producers use Salers bulls on their cowherds. If you're tired of pulling calves, tired of losing sleep, tired of paying for C-Sections, then you need to take a serious look at the built-in advantages Salers' "sleep well" genetics. 9. If you're producing fewer pounds than you used to. Research shows that - bar none - Salers calves will produce more marketable pounds than your Angus calves will, and you'll have better performance, conversion and health if you own them through the feedlot. 8. If you've lost hybrid vigor. Researchers say hybrid vigor - or heterosis - can result in a 15% improvement in performance and huge improvements in reproductive efficiency. By using Salers bulls, you'll inject a healthy dose of heterosis into your cowherd - and improve your bottom line at the same time. 7. If you've lost red meat yield. Simply put, Salers carcasses hang up more pounds of saleable red meat than just about any breed in the business. They're longer, heavier, and thicker than Angus, Hereford, and Red Angus and, for this reason; they'll put more dollars into your bank account if you sell cattle on carcass-pricing grids. 6. If you've lost marbling. Unlike other continental cattle, Salers cattle have long been know for their inherent ability to marble. Over the years, Salers carcasses have dominated some of the most competitive carcass quality competitions in the country, including the National Western Fed Beef Contest and the Great Western Beef Expo. They've also received high acclaim from packers and restaurateurs from across the country, and play critical roles in the success of many branded beef ventures across the country. 5. If you don't want to lose maternal and reproductive performance. Ask any breeder who's used Salers cattle, and the answer will be the same. Salers cattle have astonishing reproductive ability. They breed up in big country, hot country, cold country, in drought conditions or in blizzards. 4. If you're serious about range or pasture management. Ask anyone who uses them: Salers cattle get out and move. They find grass where other breeds won't go. And they'll utilize your pasture in more efficient ways than just about any breed you can find. 3. If you want marketing options. Salers cattle will fit a variety of branded beef programs - everything from Laura's Lean Beef to Certified Angus Beef. In fact, CAB's own research demonstrates that crossing Salers with Angus does not have a negative impact on marbling - or on the ability of these crossbred cattle to qualify for the program. 2. If you want to improve the health of your cowherd. Over the years, just about every producer ASA has written about has mentioned how much the health of their cow herd - and their calf crop - improved once they introduced Salers genetics into their breeding program. Salers cattle are vigorous, healthy cattle. This trait is an enormous economic advantage because it reduces your usage of - and dependence on - antibiotics and other pharmaceutical products. This means more live cattle in your program, fewer "chronics" and more pounds to sell each year. Simply put, by using healthier Salers cattle, you'll save time, money, labor, and vet bills in the long run. 1. If you're concerned with disposition. 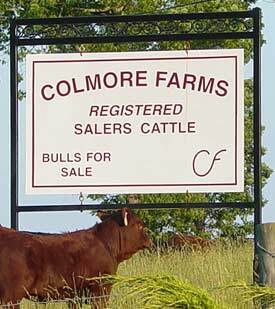 Salers producers have committed ourselves to producing and marketing quiet, easy-to-handle Salers cattle. If you haven't used Salers cattle for a number of years because of concerns over disposition, you should take a second look this spring. We're certain you'll be pleasantly surprised by how quiet and easy to handle these cattle have become - and how much better you're cow herd will be by using this great breed of cattle.